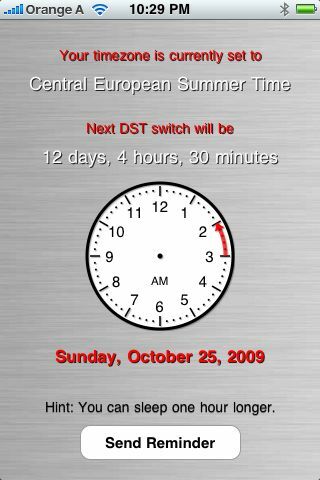 Summertime is my app that helps you to never be surprised by Daylight Savings Time transitions. A customer nudged me to update the app in time for the upcoming transitions. 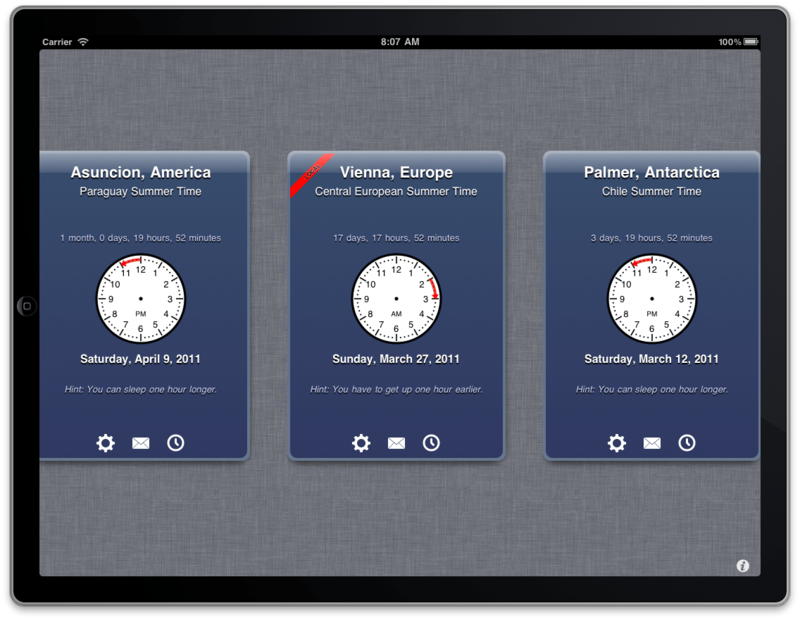 Since he is traveling a lot I needed to add the capability of configuring multiple time zones. I spend several days to enhance the functionality as described below and to polish it to a level where I can release it in time for the upcoming DST transitions. March 13th in the US and March 27th in Europe. The update is now under review by Apple. I’m rather proud of the new look which is modeled after the weather app. I’ve been working on several ingredients that made this possible. One part was to be able to localize the time zone name you see on the cards. This is typically in a form “Europe/Vienna” and there is no localization for it. 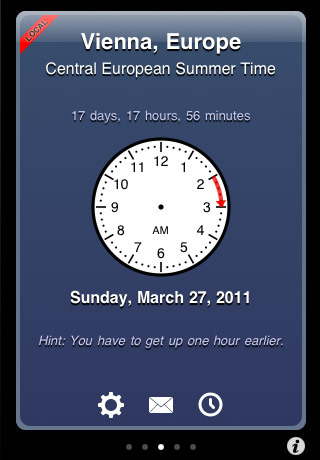 The only localized description you get is for the “Central European Summer Time”. Quite an oversight I think, that’s why I started an Open Source project to have this available in a translated way as well: NSTimeZone+Localization. In order to get a well-performing way to group and filter the time zones I added a CoreData backend which re-imports all known time zones every time the locale or the iOS version changes. With this the grouping by continents is happening automatically for me and searching via the search bar on top is a snap. Time zones which observe DST are shown in green. Those which are not are shown in red. This is also an interesting view of the world. The second part is to eventually be able to make it a universal app that behaves like the weather app on iPhone and presents a novel card-based layout and interactions on iPad. I did not get the final 10% done in time for a release, so I set the target device family to iPhone-only for the time being. Displaying and managing cards works, but I have to think of a way to do what the i-button does on the iPhone version, display a sorting table view. The general idea of DTCards is to be able to fully reuse the views you are building for a utility iPhone app but make use of the wider space available on an iPad. DTCard would allow me to pinch-open on individual cards to zoom into a more detailed view, but in this context this also does not make sense, because I’m already displaying all there is to know about the next Daylight Savings Time transitions. In short, the iPad UI is not ready. At the same time Summertime is one of my glorified hobbies with which I don’t really make nearly enough to warrant put in the midnight oil. I’ll finish the iPad UI if I ever have time or if somebody specifically asks for it or if suddenly sales go through the roof. IF to the power of 3.
s time zone and the mail button to e-mail somebody with the info on the card. I posted some screenshots on twitter and feedback generally has been very favorable. Let’s see what the customers think as soon as Apple approves the update. Update March 12th: Out now!